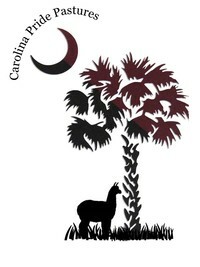 Carolina Pride Pastures, LLC: Blog: My first injury!!! Fun...Fiber...Family It's What We Do!!! The first of the month, we do herd health. Herd health for us consists of a shot of ivermectin, checking weight, toenail clipping, and general look over. During the check of Katherine, I noticed one of the pads on her foot was swollen. The other pad on the same foot was not swollen. There seemed to be a cut or tear between the two pads. There did not appear to be anything in it or puss. I noticed her hopping on that foot once she stood about a week after she arrived but she would stop after a few minutes and walk normally. I didn't think to check it then. Hindsight 20/20, right. I cleaned it with betadine. I have been using betadine and blue kote for about a week now. The swelling is half what it was!! I can now see a much longer cut, about 2 inches. I still don't see anything in it but with the swelling going down, I am feeling better!! !